We bring the physical keypad on Android for your consideration. 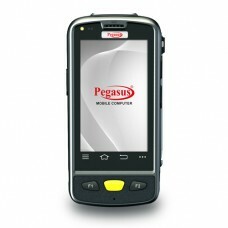 The unique industrial handheld device you can find on market Quad core processor is now ON PPT4000 series is running on a quad-core 1.3GHz ultra-fast processor,Your business speed is UP again. Anywhere Wireless Connectivity Keep operators connected outdoor and indoor with 3G cellular and 802.11b/g/n WIFI. Installed main battery and pistol battery provides 3200mAh plus 5200mAh lager capacity, supporting more than doubled power to work out. Pegasus Battery for PPT4000, ..
Pegasus - Battery for PPT40003200 mAh Rechargeable..
Pegasus PPT4000 Universal AC A..
Pegasus PPT4000 Universal AC Adapter of 100-240V, ..
Pegasus PPT4000 USB Cable is f..
Pegasus PPT4000 USB CableThis Cable is for synchro..
Pegasus PPT4000 Hand Strap sec..
Pegasus PPT Mobile Computer Hand Strap secures the..
Pegasus Cradle Charger C3000 s..
Pegasus C3000 Cradle Charger Pegasus Cradle Char..
Pegasus Touch Stylus White/Black, note the white c..
Motorola MC55A0 - Wi-Fi (802.1..
Drive efficiency inside your business to the next ..
Motorola ET1 Enterprise - Et1 ..
Everything you need to Accomplish moreThe ET1 Ente..
Motorola Symbol TC70 - Wi-Fi (.. Rugged and ready for all-day every day enterprise ..
Motorola MC40 - Wi-Fi (802.11 ..
Styled to Impress your Customers with Business Cla..